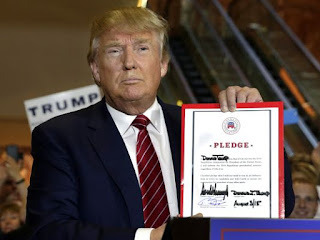 Finnerty's Blog: 4 time declared bankruptcy Trump, may make unkempt promise to support GOP nominee. 4 time declared bankruptcy Trump, may make unkempt promise to support GOP nominee. This is a patently false statement by the Donald, since bankruptcies are intrinsically a violation of a contract, and were he truthful he would have to admit that if it suited him, he retains the right to run as a independent candidate regardless of any stated "commitment" he has made otherwise. The loophole that he most likely will use to justify his independent presidential run is the caveat that the RNC will treat him fair, whatever that is supposed to mean. Subjective determination of fair treatment is in the eye of the beholder, and Trump can easily rationalize going back on his word just as he went back on his word with creditors and investors each of the 4 times Donald Trump filed for bankruptcy.